Water's value, as precious as it is today, will only increase as time passes. Jean-Michel Cousteau, the famous seafarer’s son, likes to remind everyone that there is only one water cycle, and that Humans are unable to create water molecules. Unfortunately, we never stop polluting rivers, seas and oceans, and many countries are fighting for water rich territories. Most tensions and water wars are found on transboundary rivers. These issues pushed French photographer Franck Vogel to produce a project launched in 2012 focusing on seven key rivers: the Nile, the Brahmaputra, the Colorado, the Mekong, the Jordan, the Amazon and the Ganges. 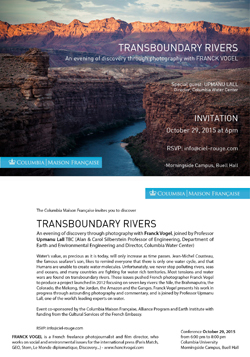 Franck Vogel presents his work in progress through astounding photography and commentary, and is joined by Professor Upmanu Lall, one of the world’s leading experts on water. Event co-sponsored by the Columbia Maison Française, Alliance Program, and Earth Institute with partial funding from the Cultural Services of the French Embassy.